Comet 302690-C (Ariens) Drive Clutch for Land Pride Treker UTV. Home > Comet Clutches and Parts > Comet 302690C (Ariens) Drive Clutch for Land Pride Treker UTV. Comet 302690C (Ariens) Drive Clutch for Land Pride Treker UTV. 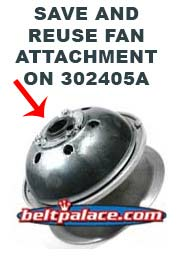 CURRENTLY UNAVAILABLE: WE RECOMMEND REMOVING FAN CAP AND REMOUNT ON COMET PART 302405A WHICH WE HAVE IN STOCK. IT IS THE SAME DRIVE UNIT (JUST WITHOUT FAN ATTACHMENT). FOR DRIVE UNIT ONLY (NO FAN CAP) SEE COMET 302405A HERE.